It's July, which means our fishing friends at Kwee-Jack Fish Co. will soon be in Bristol Bay, Alaska for the yearly salmon run. Once finished, they'll flash freeze the salmon and ship it straight to our farm. It's fresh, delicious, and the health benefits are awesome. Plus it's sushi grade so it's perfect for your favorite homemade roll. 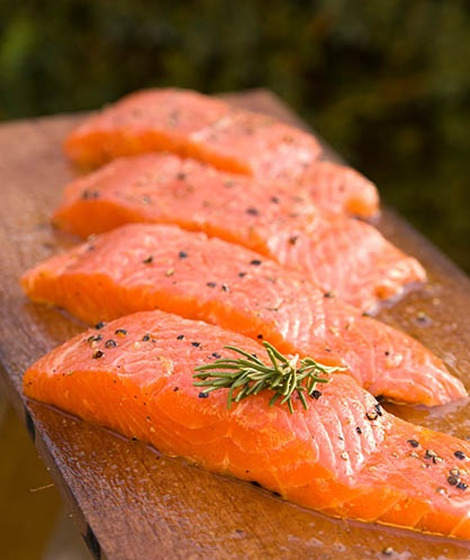 You won't find better salmon! We anticipate the fish arriving mid-September. CHICKEN CUT UPS - IN STOCK! Whole birds are also available, as well as feet, necks, heart, liver, & heads. We'll kick of July with a class on Keto, and then later in the month we'll welcome Larry & Angie Law to present at the farm for the first time. Below is what's currently on the calendar. Follow the links to sign up! Keto: what’s behind this crazy “new” diet? Does it sound to good to be true? Are you suspicious of an all-bacon diet? Come learn fact from fad with Shopgirl Kristin and see what nutritionists are saying about this massively popular diet. Let’s look “under the hood” of your metabolism to understand more of how ketogenics works. Learn the therapeutic and nutritional benefits of “Clean Keto” and how to avoid many of the pitfalls that cause people to fail. Learn how to customize a plan for you, how/if you should measure ketones, what you can expect when you begin, and how long you should do it for. Expect 45 minutes of lecture followed by Q&A. Bring all your questions and find out if keto might be a good fit for you. 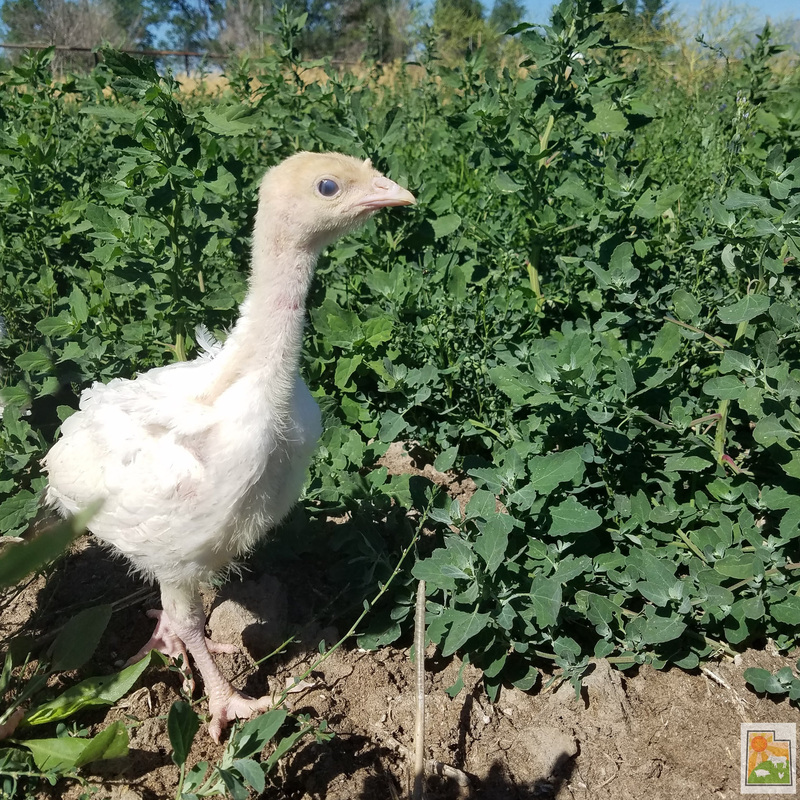 Raising chickens & turkeys is one thing - then what comes next? 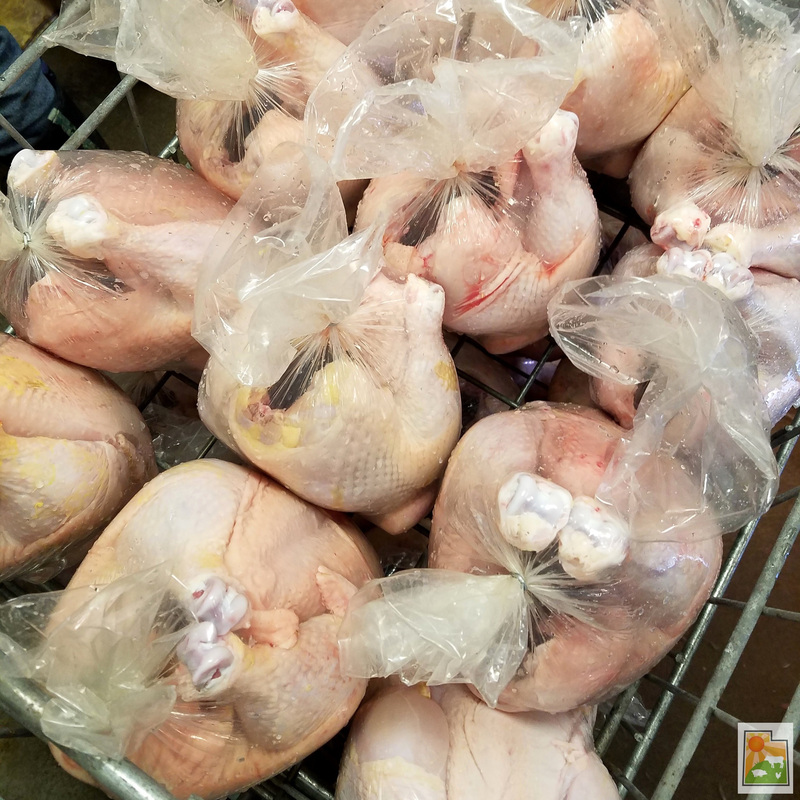 Current poultry laws make it difficult to find someone to prepare your bird for the freezer, but this is something you CAN do yourself. Farmer Shayn will teach you a valuable skill that is quickly becoming lost in our day and age. 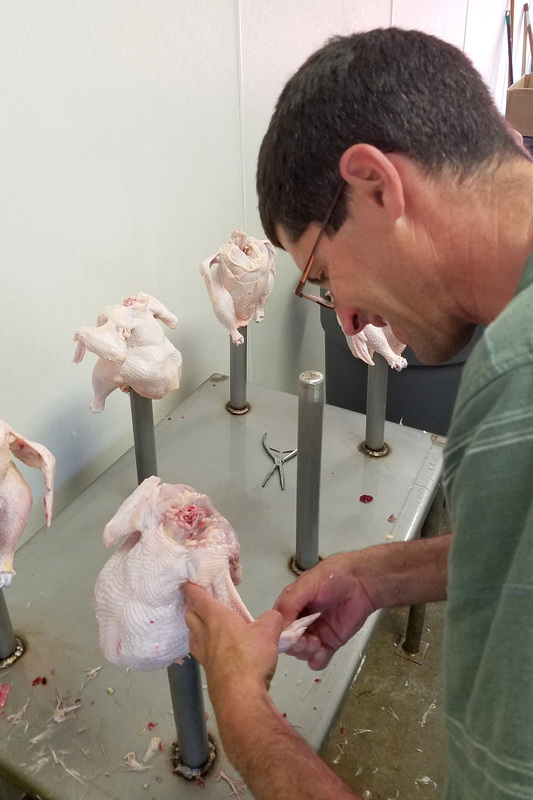 This class will give you the hands on experience of harvesting poultry, using both larger equipment and simple tools you already own. He'll also show you how to break down a bird into parts, and you'll leave with a whole pastured chicken & organs ready to cook at home. How Has Our Food Been Altered? What’s Natural About Being Synthetic? What is Glycosylation? 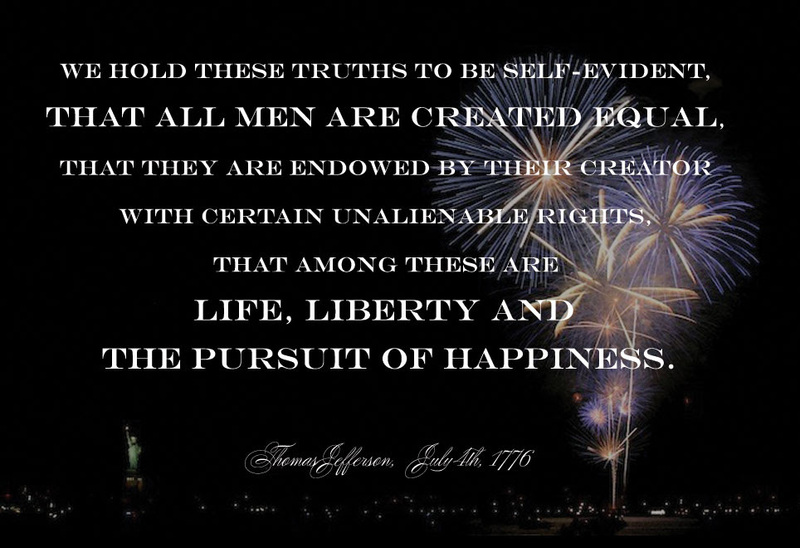 And why does any of this matter to you? Join Larry & Angie Law as we discuss these questions more in-depth and look at what has happened to the foundation of our food supply, how the “staff of life” is no longer the grain it used to be, and what GMOs are and why you need to know. This class will give you a foundation of a critical, but little known, field of science called Glycobiology. This science is the "missing link" of health and nutrition. It impacts your immune system, digestive system, cognitive function, and all body systems Learn how they are vitally supported by cellular communication achieved through glycosylation. You'll also receive a Consumer Awareness Guide to help you determine the critical difference between natural & synthetic vitamins, and organic & inorganic minerals, as well as why plant source matters and how to know if what’s really inside your bottle is safe and effective. Don't forget the opportunity to help us bottle-feed our calves! Every Saturday at 11:00am. NEW PRODUCTS - Fabulous Fats & Beautiful Broths! Calling all Lard Lovers - we've got you covered! 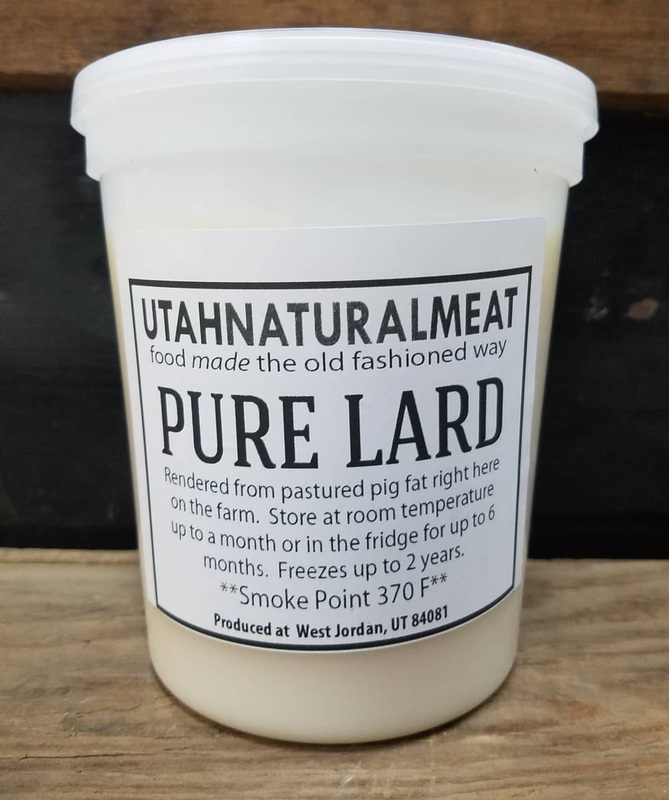 UNM Lard is now available. Made from our pastured pork, it's a healthy, real fat perfect for baking or frying your favorite foods. In stock at the farm for $9/tub (aporox 1.75 pounds). We also just finished a batch of our delicious beef bone broth. Made with our grass-fed bones & one of our pastured chicken feet, it's chock full of collagen and other healing compounds. In stock at the farm for $7.50/quart. Having these staples prepared and ready to use in your kitchen makes it so much easier to incorporate them into your everyday routine! Our next bulk orders will be available AUGUST 9 & 11. Deposits are due SUNDAY, JULY 22. Corriente beef, Angus beef, pork, and lamb are all available. Do you want to try our meat before you make a big purchase? Stop by our farm store and pick up some separate cuts. Bulk salmon cases are sold out and but we're taking deposits for the 2018 catch now. Individual fillets are still available in the store while supplies last. If you're smoking or grilling this week for your Independence Day BBQ we've got your meat! Ribs, chops, steak, salmon, burgers - take your pick of fresh cuts from the farm. 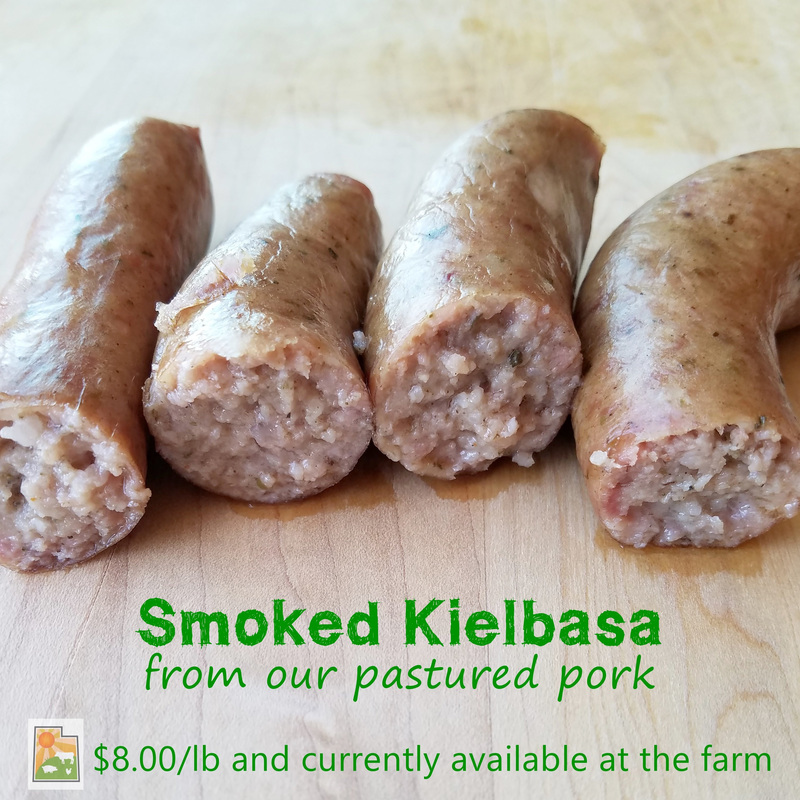 And if you need an easy, quick meal we now have UNM Smoked Kielbasa. These bratwurst are pre-cooked, which means you simply warm it and serve it - that's it! Your favorite brat is ready in no time at all. Seasoned and smoked right here in our on-farm butcher shop, these are juicy & full of flavor. Remember our tiny turkeys from last month? Once they reached three weeks old and had most of their feathers it was time to move them outside. We love observing when they make the transition & investigate their new place - pecking at grass, scratching in the dirt, running & flapping their wings. It's fun to watch them as they have the opportunity to simply be a turkey & exhibit their natural instincts.